Yesterday marked a proud moment for Oceania with the Tiki Toa finishing runners-up to Brazil at the FIFA Beach Soccer World Cup Bahamas 2017, but the Tahitians were not the region’s only representatives. Making a name for himself and the region with whistle in hand was Solomon Islands match official Hugo Pado. Although Pado has more than enough experience to officiate at a World Cup – he has participated in the previous four competitions – leading the match between hosts Bahamas and Ecuador as the main referee was an honour Pado hadn’t had the chance to experience during his 2015 outing in Portugal. Being appointed as referee in a World Cup encounter involves a lot of pressure and responsibility, but Pado is well-familiar with the requirements of the role and kept his focus on the Laws of the Game. “When I take the field I feel confident to apply the Laws of the Game because I know I’m well-prepared and ready for it and I know that I am making OFC and Solomon Islands proud,” he said. Amendments made to the Laws of the Game in 2014 made Pado’s last World Cup a bigger challenge for the match officials involved, but after two years of putting the laws into practise, Pado felt that he and his colleagues were more confident to deliver and officiate matches at the 2017 World Cup. “The key differences between the 2015 Portugal World Cup and this year is that, in Portugal, the laws of beach soccer had just changed. We referees had a lot to learn before taking the field so that we all on the right page,” he said. However, for Pado and other referees that haven’t had as many minutes on the field since 2015, the fast development of the game around the world has proved challenging to keep up with. 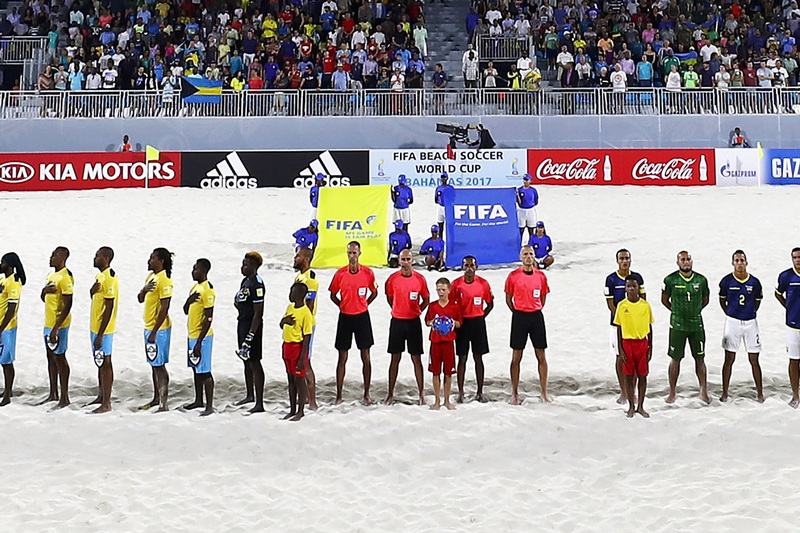 “Beach soccer has developed a lot in other confederations in the world and as a referee this is a challenge for me because I’ve had less experience than other referees,” he said. With the 2017 FIFA Beach Soccer World Cup Bahamas now over, Pado plans to return home and put his experience into action to contribute to the further development of the game in Oceania. “My goal after this World Cup is to maintain and improve on my level of knowledge, and also pass my knowledge on to my fellow Oceania referees,” he said.